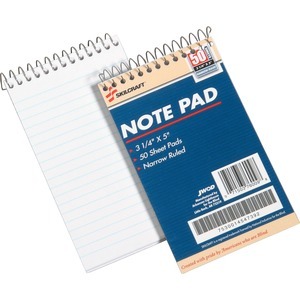 Each Mini Memo Pad contains 50 white sheets with 1/4" legal/narrow-ruled blue lines. All pads feature wire spiral binding at top. Elemental chlorine-free (ECF) paper meets Executive Orders 13514 and 13423. Sheet Size 3 1/4" x 5 1/2"